On Thursday night my seven-year-old, The Fonz, lost a tooth while attending a rodeo/carnival. He told me the news and expected me to be excited, but I immediately quoted the ancient proverb: “He who loses his tooth at a carnival in the presence of many toothless carnies, is destined to grow up to be a carny.” My warning didn’t seem to worry him, probably because he’s never met a carny, but I hope the words will gain meaning and begin to scare him over time since I’ve always feared he would grow up to be a carnival worker. Optimist Prime and The Fonz have been reading all my old Calvin and Hobbes collections. Optimist Prime read every single strip except for those on the very last page of the last book. He said he wanted to wait to read the ending because he wanted to have something to look forward to on his deathbed. Only one day left to vote in the caption contest. The winner will be posted Sunday at 6AM EST. I’ll be leaving for Edinburgh tomorrow, but I’ll continue to post and comment each day. I’ll provide more information about the play this coming week for any readers in the UK who might want to come see it. The rest of the conversation lasted under a minute and mostly consisted of me ordering him to go to his room while he insisted that he was staying with cousins and had no room of his own to go to. Safe travel to the UK and hope you have a great run of the play. Another thought on calls from/to China: My sister travels often to China and I’m amazed when she texts me “Call me”. Yep, calling my sister in China is as simple as pushing the buttons with little to no effect on the cell phone bill. It’s amazing how much easier and cheaper communication is now with text messaging and Skype. That conversation sounds like the ones I have with my nephew…and he is 17. That’s good to hear because I was questioning whether it was my fault for not being more interesting. That sounds like talking to my dad on the phone. He always ends with, “Well, we better get off here.” Like anything more than a minute and something terrible might happen… like bonding. Thought you’d just have Totinos on your death bed. I do like Totino’s better than pie, but I’ve never had death pie and in my mind it’s extremely good. That’s the conversation I have with my dad every phone call! I say “hi dad” and he says “here’s your mother” as he hands the phone off. Sounds like you two have a really special relationship. Mmm, death pie and Calvin and Hobbes! Can’t beat that combo. My son also has short conversations with me, he’s a man of few words. Usually he just grunts and rolls his eyes. I’ll take it as a positive sign that my sons aren’t grunting yet. I actually do remember that one. Bon Voyage! My son was a Calvin and Hobbes junkie, but he had to read from cover to cover. I admire your ability for delayed gratification–something people today don’t generally understand. Most people would have helped themselves to the “death pie” before it was totally frozen. Once you give it a name like death pie, it would seem like a bad omen to eat it while in good health. Carney’s a freaking scary! I ran across a couple at our local fair and felt the need for a lot of hand sanitizer afterwards. Do they all have to talk with those creepy voices? Yes, they do. It’s in the Carny Code. If you get sick, would that qualify you for just a skinny slice of death pie? Because you never really know when sickness will result in sudden death. It seems fair. Seems like even a small slice of death pie would tempt fate. The blurb about carnies made me laugh. I’ve always wanted to go to my college reunion and when people ask what I’m doing I’d tell them I’m some kind of a carnie! Me: “Hey Jim how’s it going, what are you doing these days? Jim: Oh I’m the Vice President of North American Marketing at ABC corporation. It’s a pretty good gig, how about you Steve? Me: I run the frog launch game at the Carnival… you know the one where you have to try to get the frog onto the lilly pads. It’s pretty cool, someday I hope to run the tilt-a-whirl, but you gotta start somewhere, right? My son went to the fair when he was about ten. His comment was that it must be part of the job requirements to be missing at least three teeth in the front. We had never discussed carnies with him-he came to that conclusion on his own. My dad traveled with a carnival in the late 30’s and 40’s when money was tight in his family. He was in his teens. To the best of my knowledge, he had all of his teeth, though. I never imagined carnies had children or even parents. Maybe carnies and humans really do share some similarities. Mmmm. Death pie. I’m going get me some of that! You know, if I can plan that somehow. When my son was a child, I applied heavy pressure to get him into being a carny. Think of the perks… free cotton candy and red popcorn, unlimited access to the tilt-a-whirl, and having your portrait done by the same artist that does the signs for the Gog-faced Boy and The Lizard Lady. I don’t know where I went wrong…he’s a chef now. Break a leg in Scotland! Although I would be fascinated to learn what a Gog-faced Boy is. Telephone conversations, actually any conversation, with my dad was about 90 seconds. Then he would tell me the commercial was over and he had to go. I learned to talk fast and not expect answers. My favorite dessert is chocolate souffle, but I’m not sure I should plan on looking forward to on my deathbed. It might be really hard to get the timing right for death souffle. I never thought of planning what to read on my death bed. It makes a bucket list seem silly!!! A freaking totally awesome idea! My daughter. Darth Wiggles, just got that way. I remember when she wanted to talk with me whenever I had to call the house from work. Its a bummer. Mmm, death pie. I’m sure it tastes like French silk and rhubarb. Have a safe and successful run in the UK. Lord I just hope the electricity doesn’t go out for storms and such. Shame that. Might cause an early eating. How’s bout a death can of soup . Hope you have a successful and pleasant journey to Edinburgh. Congrats on the play and break a leg (but not really). Hope you have someone watching your house while you are away. Something tells me if Todd gets in there, your death pie is toast. Can’t have that! Best of luck in Edinburgh! I was uninsightful enough to name a child Calvin. He has yet to be clean or to leave Hobb’s side. And as for the telephone call, just wait until they are 14! You’ll miss the dialogue. “I’m gonna get me some Death Pie” should be a bumper sticker. Happy day! Congrats on your U.K. play! on the day my nephew turned 14, all of a sudden, being cool uncle michael wasn’t enough. our conversations, whilst never actually founts of burbling discourse, trickled down to grunts. i feel your pain. thus, advance sample whiskey. They’ll find you interesting again once they’re old enough to drink and realize that’s the only way to make 90% of people interesting. Is that really an ancient proverb, or does one start talking in cookie fortunes when living in China? 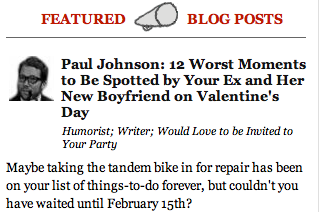 Paul, I’m behind in reading your blogs. Forgive me? Meh. No matter, I’ll still read and comment, with or without your feedback. Your feedback – your responses to my comments – they don’t validate me. It’s not like I am keeping your responses by my bed with the intent to have your responses bound so I have something to read on my deathbed. No, Paul. I am not doing that. Man, you and my husband are so paranoid. Whatever. I knew an Art Carney once. Good man. Good teeth.